Immune checkpoints represent a group of extracellular membrane-bound proteins expressed on immune effector cells (e.g. T/B cells, NK cells), either inhibiting or stimulating effector cell proliferation. They are involved in eliminating foreign pathogens while maintaining self-tolerance, playing a crucial role in immunomodulation. Nowadays, production of therapeutic antibodies designed to block or activate immune checkpoints has become a new powerful approach for the treatment of cancer and other diseases. To meet the growing demand of drug discovery on immune checkpoint targets, GenScript has partnered with Promega to developed a suite of cell-based reporter bioassays with high specificity, sensitivity and reproducibility. The Promega bioassays are complied with ICH guidelines with outstanding performance in antibody screening, characterization, potency testing and stability studies. Data include: EC 50, dose-response curves (DRC) for the samples and internal control. Therapeutic antibody discovery services – High quality antibody development platform to generate antibody leads, targeting immune checkpoints. CellPower™ stable cell line services – Using our lentiviral platform, we have generated over 30 immune-checkpoint overexpressing stable cell lines, for use in assays and for screening antibody leads against immune checkpoints. 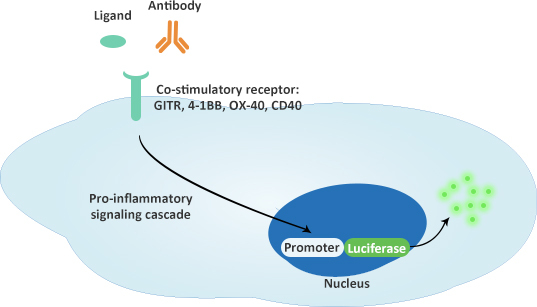 Mechanism of action: anti-GITR, anti-4-1BB, anti-OX40 and anti-CD40 antibodies function to mimic the ligand. 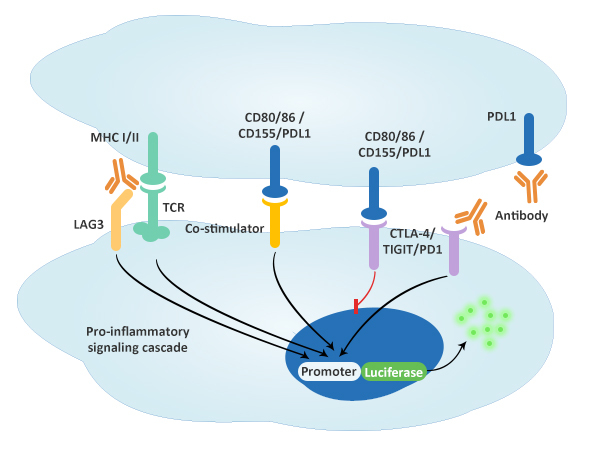 Mechanism of action: anti-CTLA-4, anti-TIGIT, anti-PD1, anti-PDL1 and anti-LAG3 antibodies block CTLA-4, TIGIT, PD1, PDL1 and MHC I/II respectively to activate the downstream production of reporter enzyme.